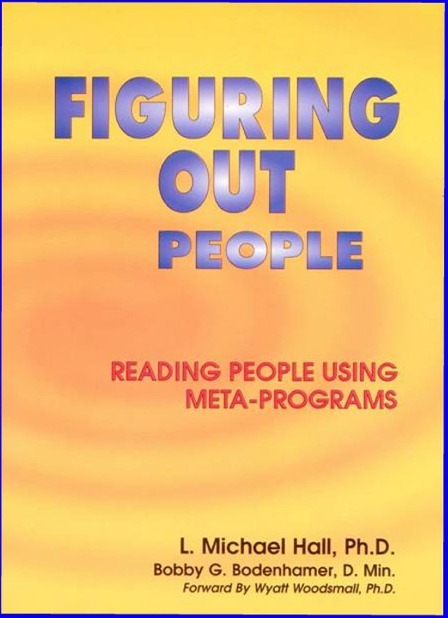 Figuring Out People: Design Engineering With Meta-Programs (1997b – 2000). Discover how to read people like a book. Figuring Out People offers the reader insights into how to understand your spouse, children, friends, employees, employer, customer, etc. Drawing from numerous areas of human research (NLP, Cognitive Psychology, Perceptual Psychology and Developmental Psychology), it distills them down into meaningful “patterns” that the reader can easily apply to figuring out anyone. Why people do things will become as obvious as the nose on their face. Our publisher says, “Bodenhamer and Hall focus on not what people are, but exactly how they function! We are challenged to understand how people function, and change our behavior accordingly to communicate successfully. Only when we have discovered this, can we respect and communicate with those with whom we live. An essential read for all!!! !” For our NLP readers, from your NLP training and reading, you know the first 13 meta-programs. Now expand your understanding to include 51 meta-programs along with several new cutting-edge distinctions. Preface by Wyatt Woodsmall, Ph.D ($35.00 & $5 S&H). Paperback-291 pages. Published 1997 & 2000 by Crown House Publishers in Wales, UK. Figuring Out People: Design Engineering With Meta-Programs fills a serious void in the literature of Neuro-Linguistic Programming. Meta-programs allow us to understand human behavior and human differences, and even more important, they reveal to us how we may vary our own behaviors and communications to become more successful in relating to and changing our own, and other people’s, behaviors and models of the world. Meta-programs are probably the greatest contribution the field of NLP has made to understanding human differences. Only by understanding and appreciating human differences can we begin to respect and support other people whose models of the world differ dramatically from our own. Only by understanding human differences can we begin to replace animosity with understanding and antagonism with compassion. Only once we realize that other people are not just behaving the way that they do in order to spite us, but because that is their fundamental pattern can we begin to replace conflict with cooperation. Unfortunately until recently there has been very little written in the field of NLP on this highly important area. I am excited about the authors’ outstanding contribution to this area which lies at the heart of NLP. I was already interested in the general area of human typology when I began my NLP training in 1981. I was trained and certified in the Myers-Briggs Type Indicator and had learned the Enneagram Personality Model from the Arica Institute before I came to NLP. I inquired curiously to see if NLP has similar personality models and felt excited to find that it did. I first learned meta-programs in 1982 from my NLP teachers Anne Linden and Frank Stass. I also had the good fortune to attend Roger Bailey’s training on his IPU Profile. I then learned the Clare Graves Value Model (1984) from Chris Cowen and Don Beck. I was excited about all of these powerful models to explain human similarities and differences and took every opportunity that I could to tell others about them. Anthony Robbins was one of the first people I taught them to. I met Tony at a modeling training of John Grinder’s in September of 1983. I got Tony involved in a modeling project that I was engaged in on pistol shooting for the US Army. As Tony and I became friends, I taught him all of the NLP Master Practitioner patterns including meta-programs and values. Later, I assisted Tony in teaching his first NLP Professional Certification Training (Feb. 1985). During the Second Certification Training (Sept. 1985), we added a Master Professional Track. There in Colorado, I taught both meta-programs and values and met my three most senior students: Marvin Oka, Richard Diehl, and Tad James. Next, I taught a NLP Practitioner and Master Practitioner Training in Honolulu, Hawaii to a class that consisted of Tad and Ardie James, Marvin Oka, and Richard Diehl. Soon all of these people felt as excited as I did about the Myers-Briggs, meta-programs, and the Graves Values Model. Tad and Ardie began to use meta-programs in their business with excellent results. This led to the collaboration between the James’ and myself to develop the Meta Programs and Values Inventory and the material on meta-programs and values that was published in Time Line Therapy and the Basis of Personality. My wife Marilyne and I have spent the last decade applying meta-programs and values in business, performance enhancement, and therapy. Marilyne and I have recently finished a book on the application of meta-programs in business, People Pattern Power, and a book on the applications of values to society. I find it very gratifying to see Michael Hall and Bobby Bodenhamer–who are two people who I helped to train– become as excited as I am about meta-programs. It is even more gratifying to me that they have accepted my admonitions: “NLP does not end with John Grinder and Richard Bandler” and, “It is up to all of us to further advance the field.” They have accomplished this in this excellent book. The authors have immersed themselves in NLP and meta-programs and also in general-semantics and the latest developments in cognitive psychology and therapy. It is refreshing to find that the authors are not just cacooned in the field of NLP, and that they have extensively studied the origins of NLP in general-semantics as well as other disciplines that bear on NLP and its application in the real world. I have had the privilege of knowing both authors for several years and one thing that has impressed me about both of them is their integrity, their compassion, and their dedication to applying and expanding NLP into areas of the world where it has not traveled previously. This has not come easy. Both have made major sacrifices to pursue their interests in NLP. While all too often readers may assume that somehow books just happen, they don’t. Nor is this book an accident. It has resulted from long, hard work and study and a great deal of sacrifice and dedication to the field of NLP on the part of both of its authors. For this they deserve our gratitude and thanks. Figuring Out People is unique in several ways. First, it explains the origins of meta-programs and places them in the larger context of human growth and change. Secondly, it provides an in depth discussion of meta-programs. And thirdly, it expands on the field of meta-programs and makes a significant new contribution to the field. I will briefly touch of each on these points. Figuring Out People has an excellent discussion on the origin and history of the development of meta-programs in NLP. It also places some very important frames around meta-programs. NLP essentially involves a process of “de-nominalization” and the authors begin their study by denominalizing both “personality” and “meta-programs.” They make the crucial point that meta-programs deal not with what people are, but with how they function. Figuring Out People presents an excellent typology of meta-programs. You can classify people in many different ways. The critical question remains, “Is the classification useful?” We only have 5-to-9 chunks of attention, and with 51 meta-programs to be considered, it would be easy to get lost. The authors help us to avoid overload by chunking meta-programs into five categories (i.e. mental, emotional, volitional, external response, and meta). This approach provides both a valuable contribution to the typology of meta-programs themselves and a very useful map to help us sort out these powerful patterns. For each of the 51 meta-programs they have provided valuable information on how to elicit and apply. The appendices to the book are extremely helpful, and I suggest that the reader familiarize himself with them at the beginning, since they serve as an excellent guide to the text. Also they are invaluable for future reference in eliciting and utilizing meta-programs. Perhaps the most exciting part of Figuring Out People is the major contribution that it makes to the development and expansion of meta-programs. I have already mentioned the significant contribution that the authors make in their new typology for meta-programs. This book also covers more meta-programs in more depth than any other book in NLP. Its value does not just stop there, however. Its virtues are not just expansiveness and comprehensiveness. Perhaps its greatest virtue lies in the creative insights of the authors into the subject of meta-programs in general and into each of the meta-programs in particular. The authors challenge us to both understand and apply. And they continually give new avenues for further exploration and study. This makes this book so valuable. It is truly generative and will lead to the further development, explication, and utilization of even more patterns as we strive to understand and apply its insights. This is perhaps its greatest contribution. Identity/ Self/ “Time”/ Problems/ Morality, etc. Now I Think I Can Figure You Out!